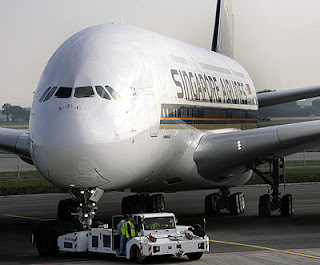 Congratulations SQ to the successful start into a new era of flying with your new Airbus A-380. It's not only a milestone in the quantity of passengers being able to be lifted off but also in the renown quality of services and the extraordinary comfort in all 3 classes. 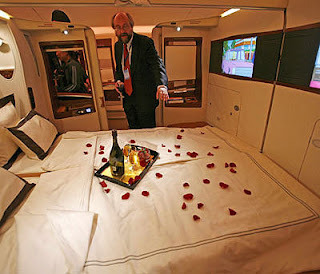 Starting from comfortable seats, legroom and big screens in Economy, to the flat beds in Raffles class and the new suits in First Class which sets new standards in luxury and comfort. To all Austrians in Singapore and abroad Erich’s Wuerstelstand wants to wish you a Very Happy National Day! We can all be very proud of our achievements since the end of World War II. 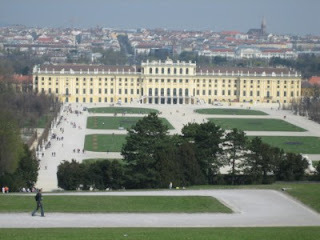 Austria’s economy is doing well. Our small Austria is the 7th most important country of the European Union in trading with Singapore. 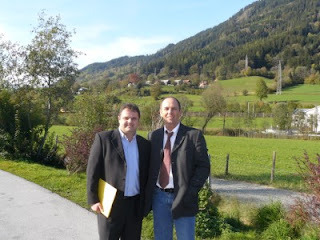 However it seems sometimes we are hiding somewhere in the Hinterland instead of being proud of Austria. 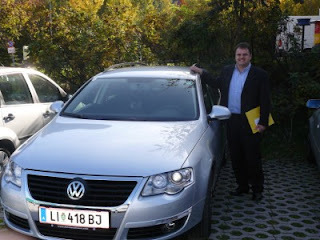 This occasion and my recent trip to Austria made write the following post. 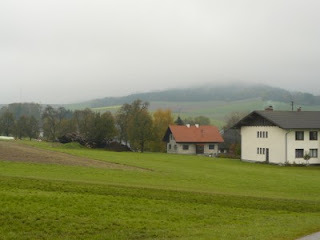 I’m back from a business trip to Austria where I got the chance to see my parents over the weekend. 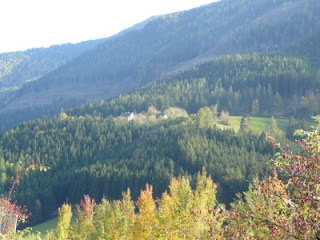 They had a few amazing autumn days so we had to get up to the mountains for a hike. 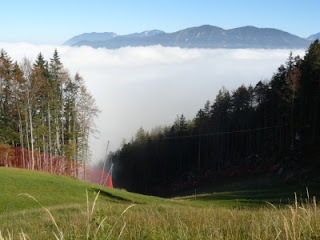 It was such a beautiful Sunday with fog in the morning and blue sky from noon to evening which you can see on my photos. 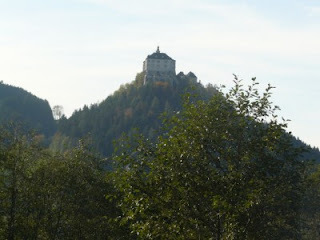 We drove to Hinterstoder which is about an hours drive from Linz (Upper Austria). 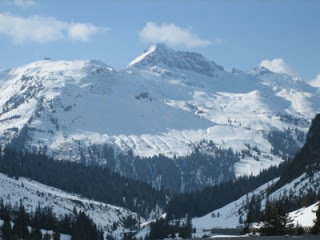 Hinterstoder is well known as a family ski resort in winter as well. 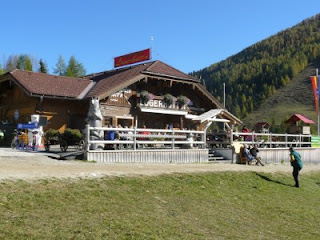 After hiking around the small lake we broke for a snack (Jause) at the Loegerhuette(website unfortunately in German only) which is the most popular Restaurant there in an altitude of 1420m . The owner Ernst and his family have been running this business since many years. Dishes are traditional for the region, most of the raw material is from their own farm and their service is the best by far. 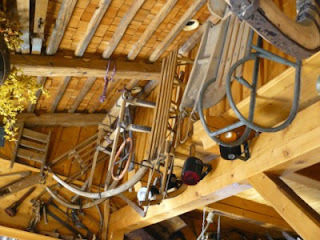 Once you enter you feel like being in an alpine and ski museum. 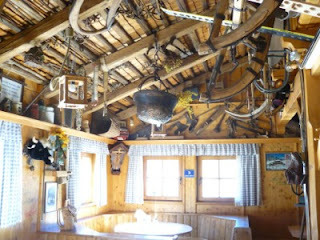 It is nicely decorated with original antique stuff and looks cozy like a livingroom . It’s definitely worth a visit summer or winter. That beautiful weather also brought many paragliders to the mountain top to enjoy a smooth flight and gorgeous view over the peaks. Lucky me it was only the second last day before I left when the weather changed over night and temperatures dropped from 20 deg to zero. Some of the mountain regions got dumped with 1 m of fresh snow perfect for them and not unusual for this time of the year. Back to lovely warm Singapore I read the Straits Times and saw another annoying report about the beauty of Switzerland and the Alps which you can find at least once a year in various newspapers or magazines. Dear Swiss readers please forgive me as there’s nothing wrong with promoting your wonderful country since it’s very similar to Austria. What really annoys me is the fact that whenever I find reports about Europe and the Alps 90% it’s about Switzerland, in fact congrats to your Tourism Board! 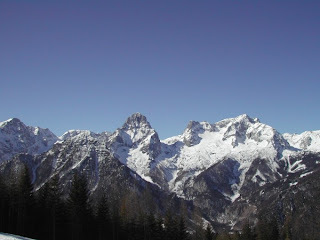 Additional to the Alps we got a rich culture, history and wonderful people which other countries only can dream of. And it’s not only “The Sound of Music” we have to offer. Which by the way is mostly unknown by Austrians, since it is a pure Hollywood production and to my knowledge has never been shown in Austria's cinemas. This “Van Trapp” family was real however the rest is Hollywood. I only learned about this movie a couple of years ago in the USA and since I’m in Singapore I also had to find out that Sound of Music is about all most Asians know about Austria. So disappointing! 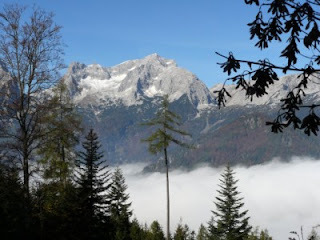 Austria is well known for music: Classic: Mozart, Strauss (Viennese Waltz) and Pop: Falco (No.1 hits even in the US) and like it or not even DJ Oetzi (with No.1 hits in quite a number of countries). 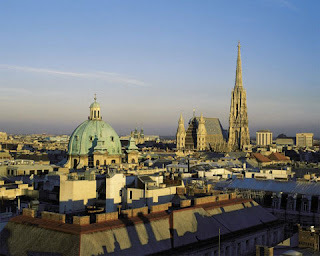 Cities: Vienna with all the beautiful historic buildings since the monarchy (e.g. Empress Maria Theresia). 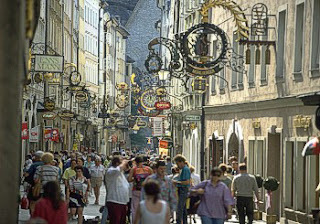 Salzburg: this quaint town with the Alps in the background and its monasteries and the Altstadt (old town) with Getreidegasse (a renown narrow street) where Mozart’s birth house is located. 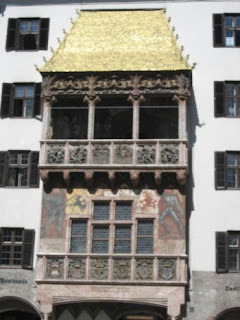 Innsbruck: surrounded by the Alps and “Das goldene Dachl”(Golden Roof). 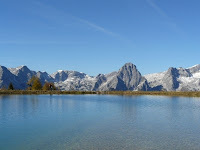 Austria’s picturesque lakes are another must see visiting my lovely country and not to forget some of the best ski resorts in the world and by far the BEST SKI TEAM. 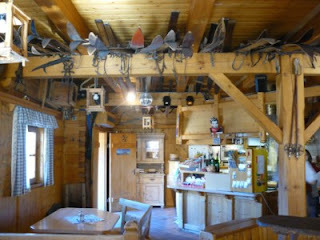 We also got delicious food (Wiener Schnitzel) famous cakes (Sachertorte- one out of dozens) and tasty wines. I would be able to continue pages by pages but that would end in probably too much of patriotism. 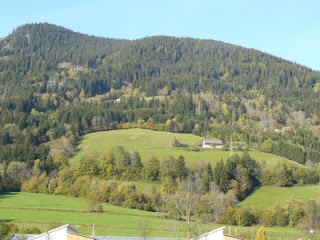 I just felt the need dear reader I do hope I made you interested in beautiful Austria. If you want to know more about it just follow some of the links. For everyone wondering how he’s doing I went on a fact finding mission to this remote hinterland. His Excellency found a few minutes in his tight royal schedule and allowed me to meet in a highway coffee shop. Harald was relaxed, settled and showed his famous big smile when I came to find out about his well being in his new kingdom. King Harald arrives in his new toy. He looks great and seems to enjoy the Austrian cuisine again. “Mommy” is taking good care of her “lost” and recently returned baby and tends to spoil the boy with great styrian cooking. To me it looked as if it already has left some visible marks around the mid section. So far Harald was lucky with the weather which couldn't’t have been better at this time of the year: Golden and warm autumn days to make his move from beautiful Singapore less painful. 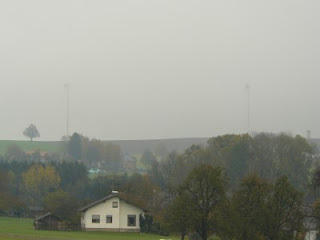 However there will soon be an end and fog, cold and rainy weather will be on the daily menu. Harald fooling around as usual asked me to give his best and greetings to all kangaroos in S’pore.